New for 2009! Ann is currently working on some special custom orders for us. She did not show at Idex this year but we will have more new work from her soon. Be sure to email kmalone@dollery.com to get on our Timmerman mailing list. For those of you who are not familiar with Ann's work be sure to email us your info for a free catalogue with detailed bio info or we can email it to you. We have been carrying Ann's work for over 10 years. She originally worked in resin limited edition original work normally in editions under 26 for many years and her work was highly sought after in the 2K and up to $3500.00 range at one point. Ann always sculpted for companies like Georgetown that re-produced her work. Finally in 2004 she decided to take over control of her production work and decided to create Madeleine and Susannah shown way down the page. These were done in resin like her original work was originally done and although they were done overseas; Ann painted each face herself and clothed them in America. We have just two left - great buys. They didn't last long as we expected since this was a great deal of work for Ann and at these price points it just couldn't last. In 2006 Ann came back with her original work but in porcelain this time! We fell in love with "Joy" shown down the page. We have just one left of her in stock. Beautiful. Andrea did very well that year also. In 2007 Ann debuted "Millie" and she was very successful in her little red and white costuming. Then this year she was done as shown below in the peach which we adore! She has also debuted two new sculpts. 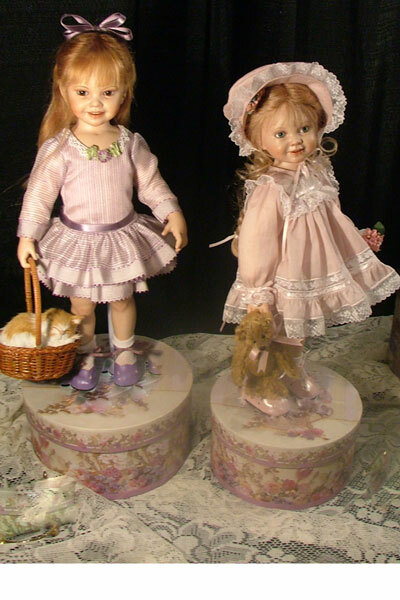 All three of these dolls are completely ORIGINAL and each aspect of the doll is created entirely by Ann herself. Ann Timmerman at our 2006 Doll Show! 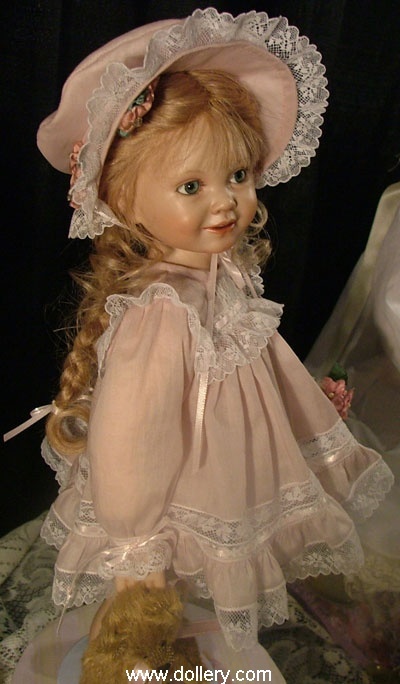 Ann Timmerman at our 2004 Doll Show! Red hair, brown eyes, 13". Limited edition of 10 of the sculpt, Limited edition of 5 of the outfit. 14.5" standing. White porcelain with cloth and armature bodies. Human hair. Masterpiece soft glass eyes. Millie - Left - This is an edition of 20 of the sculpt introduced last year but this one is in a ooak costuming (left) below. Ann has also changed the accessory. New photos are coming on this. Email kmalone@dollery.com. To the right is Ellie Mae - new for this year. See details above. 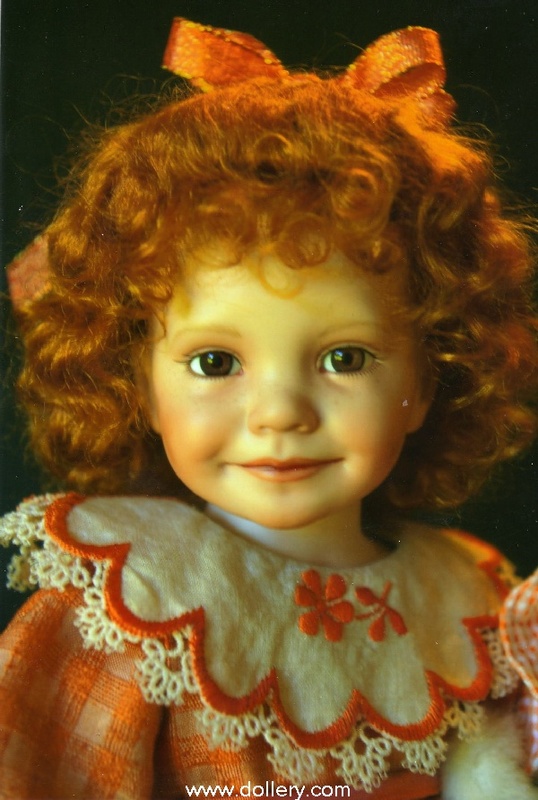 Mary Beth - Was introduced at our 2007 Doll show for the first time. She is featured above as "Ellie Mae" in her new costuming. Millie, $1,600 Sold out in this style. Limited edition of 20 and Limited to 10 in this outfit. 15", White porcelain with cloth and armature. Brown hand blown glass eyes. Dark Brown Mohair Wig. Millie is dressed in a white pique smocked dress with little red polka dots and trimmed with red rick rack and antique red mother of pearl buttons. She wears red leather shoes. 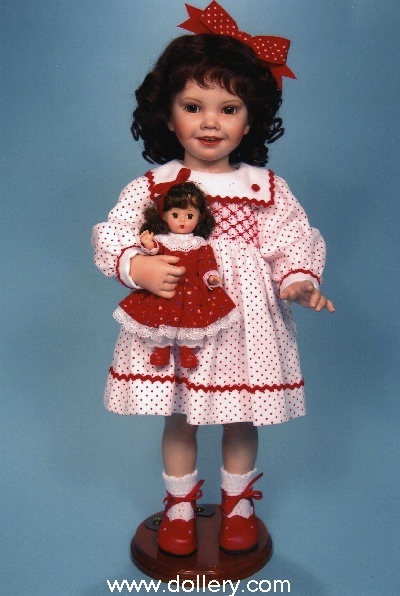 She comes complete with her Madame Alexander doll wearing a red dress trimmed with eyelet and lace. Limited edition of 10 of the sculpt and limited to 5 in this outfit. 26" standing and 21" when seated. White porcelain with cloth and armature. Blue hand blown glass eyes. Red Human hair Wig. LE/5, One of a Kind theme, 26", Auburn hair, brown eyes, antique lace, gold necklace. Joy (below), $2,650 - SOLD - gorgeous! LE/5 (sculpt and outfit), Porcelain, Cloth and armature. 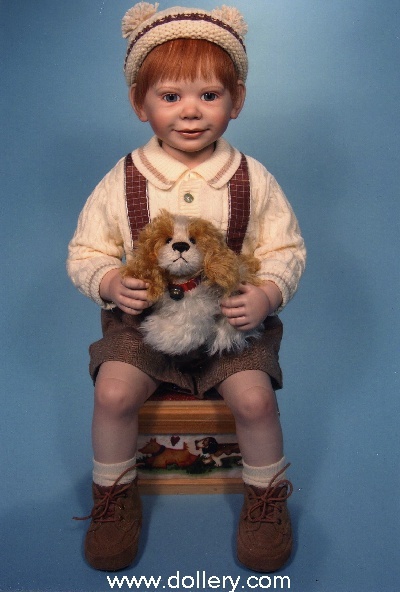 Sculpted leg over knee, grey/green glass eyes, blond mohair wig, 21 1/2". Joy is dressed in silk organza. LE/4 (sculpt), LE/2 in this outfit SOLD, and a third with another outfit SOLD.. Porcelain, cloth and armature. 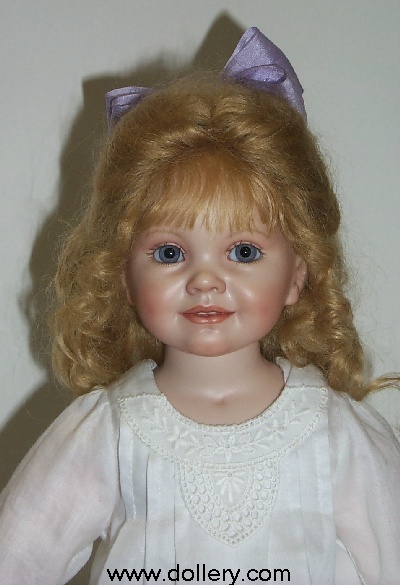 Available with bent knee (not shown), grey/green glass eyes, blonde mohair wig, 21". Andrea is dressed in a silk dress with velvet jacket with ribbon roses. N Dollery Favorite! Email kmalone@dollery.com for further information. Both are LE/100 sculpt and 50 of the outfit, hair, eye color) They are fully poseable resin with cloth bodies and armature. 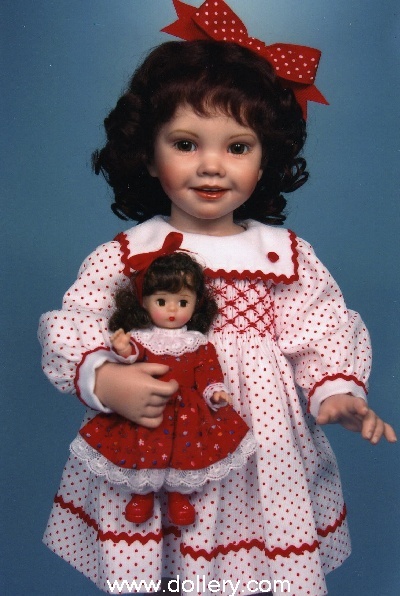 All dolls are dressed in batiste dresses and leather boots. 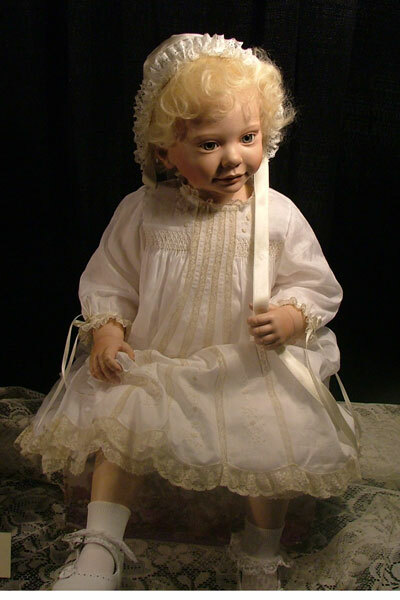 The smaller dolls come complete with their babies and their dresses are accented with tulle and netted laces. (Victoria Rose's and Annemarie's dresses are not that pink. I'll try to get better images. 2002 Update: Don't miss these new small limited edition resins by Ann Timmerman! They are absolutely beautiful and so reasonably priced. Ann hasn't really had any small editions since Georgetown and those were porcelain and really not comparable. These are superb! They are so close to her original work's look because they are done in resin which she normally works in for her originals which sell for $2500.00 to $3500.00. We think even those collector's who have her original work will love these! We thought they were one of the definite winners of toy fair and expect them to be sold out quickly with small editions of just 100 pieces world wide! Don't miss them! Taking orders now, 25% down, balance due when in. To order call 781-447-6677 ext 0 or ext 15 in Ma or 800-447-3655 ext 15 or ext 0 out of state or email kmalone@dollery.com. Don't wait! These were sold out at toy fair and won't last long! Ann hasn't really done any original work in the last two years. If you are looking for "true to life" work of art - take a look at Ann's work. She basically produced just 2-3 a year for the last five years. If you have further questions feel free to e-mail us at kmalone@dollery.com. Click On Photo For Entire Image! Photo For Entire Image! 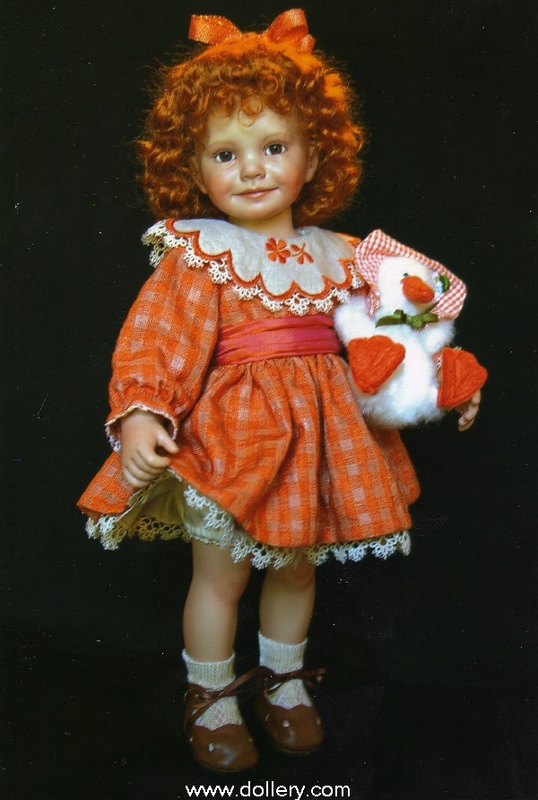 Rosemary - Brown eyes, brunette hand-knotted mohair wig, fully posable, silk dress exquistely hand-embroidered smocking. Leather shoes. Wooden doll-stand. 22 inches, 55 cm, Resin, cloth body with armature. Rosemary - $285.00 - Great price! 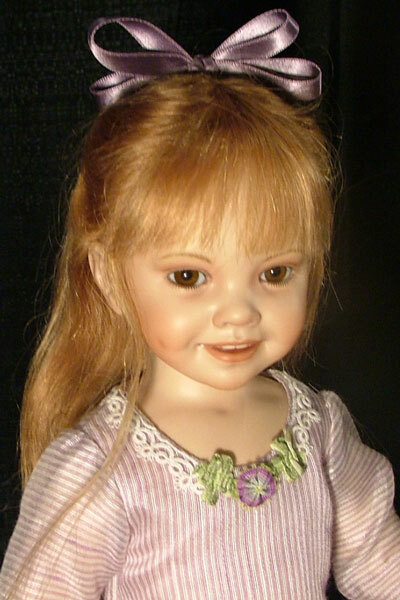 Ginger - DOLLERY FAVORITE - Blue eyes, ash-blond hand knotted human hair wig. Fully posable. Silk dress with and-embroidered smocking and fine lace. Leather shoes. 23 inches, 58 cm, Resin, cloth body with armature. 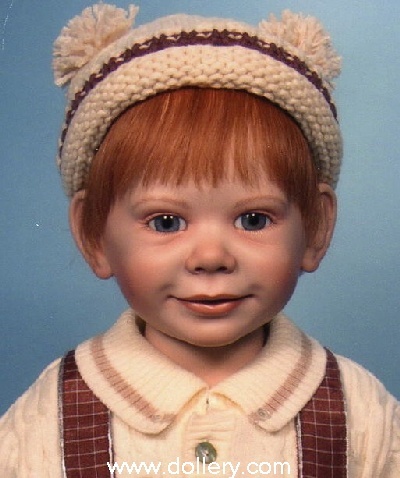 Ginger - $352.00 - So reasonable! 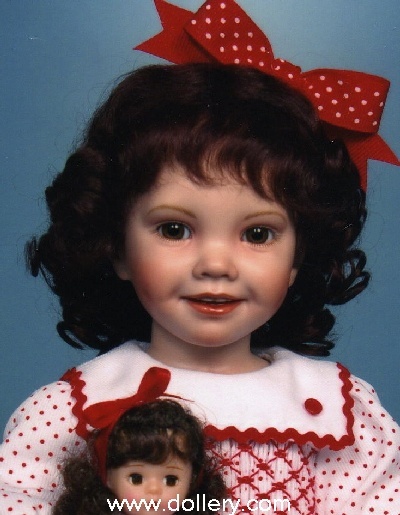 Sugar - Dollery favorite - Brown eyes, dark blond hand knotted mohair wig. Fully posable. Batiste dress and bonnet exquistely decorated with lace and hand embroidery. 18.5 inches, 46 cm, resin, cloth body with armature. Sugar - $265.00 - looks adorable with Ginger! Click On Photo For Entire Image! Johanna & Johanna II Same Sculpt! We have just one Johanna II available for 1999. The edition is sold out nationally. This is the only original doll Ann has created for this year. She will be in a one of kind outfit. 1999 Johanna II - Ltd. 10, all one-of-a-kind outfits. Ltd. 20 - Resin - Sold out edition. Copyright Merry Christmas Shoppe/The Dollery - All images are property of Merry Christmas Shoppe/The Dollery and can not be taken off this site without permission.